Combustion pressure forces the ring down on the lower ring land and out hard against the cylinder bore. Exploded view of typical honed cylinder bore that piston rings are required to bed-in on. An explanation of the importance of correct run-in procedures for 4 stroke combustion engines. The honing procedure used on reconditioned or rebuilt engines necessitates that the rings are subject to a run-in procedure that establishes a good seal between the ring & the cylinder. The run-in procedure is responsible for removing any peaks or high spots on the cylinder bore's to the point where the cylinder finish has a plateau area of more than 50% and up to 75%. At this point satisfactory run-in has taken place and the rings will have good compression control. Complete bed-in of rings may take as long as 10,000kms. 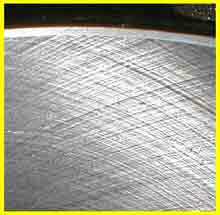 This will depend upon the quality of the cylinder honing and the application of the correct run-in procedure . Another important factor in the run-in procedure is the use of a suitable run-in oil. Always avoid any friction modified additives. Most standard oils are suitable but experience will show some to be more suitable than others. Correct run-in depends upon the ring being able to make contact with the cylinder bore under controlled conditions. Light loads and friction modified oils don't allow this condition to occur. There is a fine line between the pressure exerted on the ring to obtain enough contact to bed-in and to actually overheating and scuffing the ring face. Light loads on initial run-in will allow combustion to pass by the rings. This escaping combustion burns & oxidises the oil & bore fragments forming a chemical coating on the honed bore. This chemical coating is known as "Glazing" and has the appearance of golden varnish with the original hone finish being very visible. Once an engine is glazed up it is usually impossible to achieve complete bed-in of rings. The glazed coating prevents the ring to bore contact required to match up or bed-in rings. Incorrect procedures or overloading during the initial road test can cross the fine line and cause ring pickup & even piston seizure. The heat created when the rings contacts the cylinder bore during the loading phase of initial bed-in has to be controlled. The control of this phase is as important as using the correct load. The initial start up & normalisation of the engine before the road test has to be kept to a minimum time. Avoid any idling. Carry out the initial oil pressure test, timing & mixture adjustments as quickly as possible. Without any further explanation the following procedure are required to establish speedy and satisfactory ring bed-in. (a) Establish oil pressure at cranking speed (without compression or ignition) . Recheck when started. IRRESPECTIVE OF HOW WELL YOU MAY LUBRICATE DURING ASSEMBLY DAMAGE WILL OCCUR IF THE ENGINE IS FIRED UP WITHOUT FIRSTLY GAINING OIL PRESSURE. The safest method to obtain initial oil pressure is with the use of a pressure primer connected to the oil gallery while slowly cranking the engine. ……….The engine must never be fired up without firstly gaining oil pressure If the engine has been assembled with the correct clearances, correct machine finishes and assembled with the correct amount of lubricant in all of the right places it is quite safe to obtain oil pressure at cranking speed with the spark plugs removed. It is important to keep this procedure as short as possible as excessive cranking will reduce the effectiveness of the assembly lubricant. The pre-filled oil filter should be left loose so trapped air can quickly be dispelled, re-tighten when oil pressure is obtained. Some assemblers may still experience failures using this method simply because the correct assembly procedures were not used. (c) Set idle speed and mixture ( if applicable). (d) Pressure test cooling system. (e) Carry out these procedure as quickly as possible avoiding any prolonged idling. (a) Road test vehicle avoiding any prolonged idling. (b) As soon as possible select a gear, usually top gear, and slow vehicle to a suitable speed where full throttle can be applied without instant gaining of rev's. Hold this full throttle position for around 8 to 10 seconds, avoid severe pinging. If pinging is evident speed is too slow or ignition timing is too advanced. If rev's pickup instantly the vehicle speed is too high or gear selected is to low. During this 8 to 10 seconds of full throttle operation, vehicle speed & rev's should gradually increase around 50% to 100%. For example from 50kph in top to 80kph in top would indicate the correct conditions. (c) A rest period of at least twice the time spent at full throttle should now be taken. The rest period means the throttle should be reduced to around ¼ throttle for at least 20 seconds. This rest period allows the temp of the compression rings to normalise. (d) This same loading and resting procedure has to be carried out at least 10 times during the initial road test. 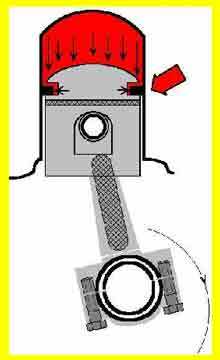 Abort run-in procedure if temperature or oil pressure is abnormal. Recommence after rectification. (b) Avoid pro-longed high speed, light throttle operation. (d) Vary driving conditions & speeds. (e) Keep close check on engine temp & oil pressure. (f) Daily check oil & water levels. Report any usage to workshop. After 800kms the vehicle should be serviced as per instructions and normal driving & servicing conditions adhered to from that point. NB. Glazing usually takes place within the early stages of bed-in, so the initial road test & first 100kms are the most important.